"Hopper frequently used a straight. horizontal motif, usually a road or railroad track. to construct the space within the picture and to emphasize the division between the picture space and the viewer's world. Indeed, the more the viewer tries to penetrate the depths of a Hopper painting, the more impenetrable it becomes. What holds the viewer is that the artist's vision seems under control and yet, on closer inspection, the viewer realizes that the visible surface is a tissue of improbabilities and unreadable shifts in space. Hopper's view that nature and the contemporary world were incoherent contributed to his artistic vision. "1. Indications of the structure of the house were brushed in with a minimum of black paint in a turpentine mixture. The columns and windows on the right shadowed side of the house clearly show this. 2. The house was then painted from dark to light: Hopper gradually added more oil paint to the turpentine and built up the forms with free, often diagonal brushwork. 3. The side of the house in bright sunlight was executed less freely with transparent darks and opaque lights. Lines of blue were added after the opaque white to define forms. 4. The railway line and embankment were also executed from dark to light. The orange and ochres on the bed of the track are virtually impasto with short brushstrokes applied in various directions. 5. 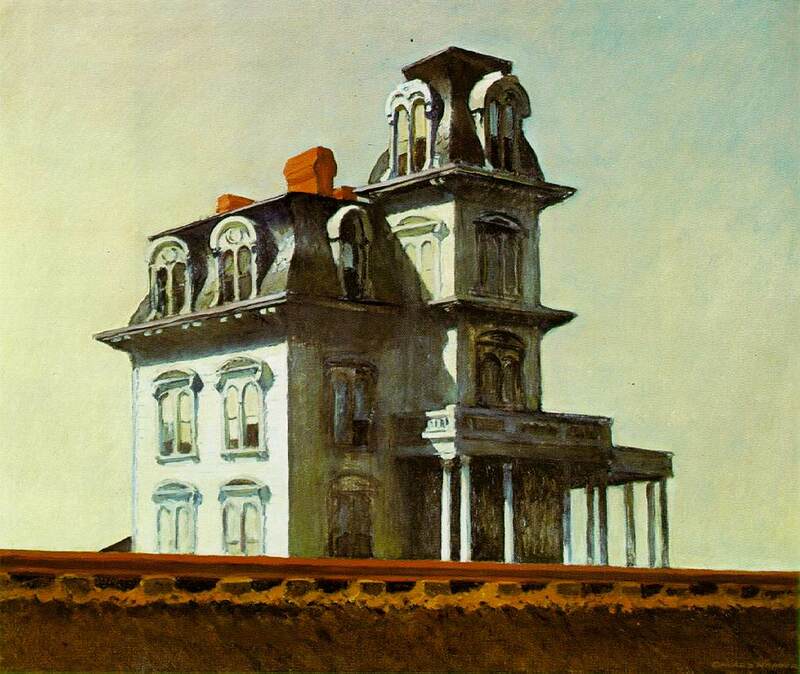 Although the sky may well have been indicated from the start of the painting, it appears to have been brushed around the form of the house and may have been the final part of Hopper's painting procedure. In the blue areas,the paint is thin with the grain of the canvas clearly visible. White areas were applied more thickly, but not as thick as those of the house, and brushstrokes are visible."